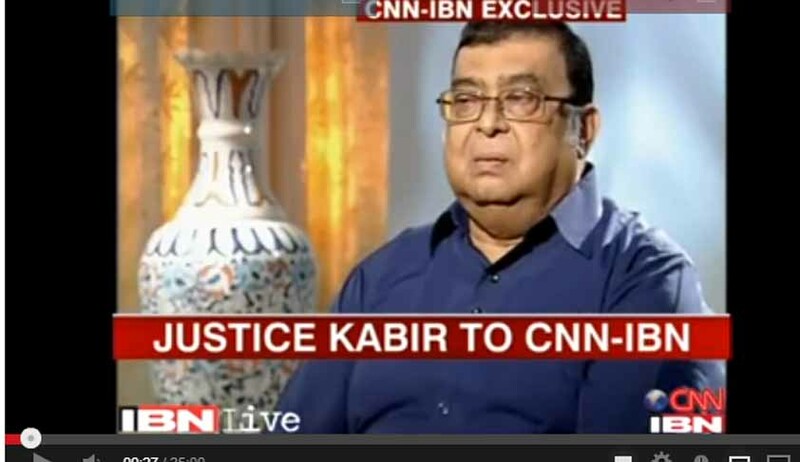 Former Chief Justice of India, Justice Altamas Kabir spoke to Karan Thapar in Devil's Advocate on CNN-IBN. Live Law brings to you the full text of the interview along with the video. Karan Thapar: First, we shall be speaking of the issues connected to your Chief Justice tenure, before we come to wider issues connected with the judiciary. It has been alleged that the recent ‘NEET judgment’ was leaked through private medical colleges two weeks officially before you delivered it. Is that true? Justice Altamas Kabir: I wouldn’t know because I don’t know that it was leaked. I have no knowledge whatsoever. Karan Thapar: I’ll tell you why people ask this question; because the leading Supreme Court Advocate Gopal Sankaranarayan, on his blog, before the judgment was officially delivered, actually predicted that it would be in favor of private medical colleges, he predicted the basis and grounds for that inclusion, and he also predicted that justice Dave would dissent and people say, if he’s got so much correct before the judgment is delivered, surely it proves that the judgment was leaked. Justice Altamas Kabir: Right, let me put this in another way. Who gains by this leak; number one. Number two is, how did he know that Justice Dave was going to dissent. If it had to be, say suppose it was leaked from my Chamber, from my Chamber here in the Court, or in the residence where the judgment was prepared, supposed it happened here. How would anybody know that Justice Dave is going to dissent? So its, my view is simply its some kind of speculation. Karan Thapar: So, infact what you’re saying is that there is no question of a leak but just some sort of a co-incidence that Gopal Sankaranarayan predicted so accurately what the outcome would be? Justice Altamas Kabir: Not very accurately. What he did predict, to some extent it was true, was that it would be above a hundred and ninety pages. Karan Thapar: He predicted that you would be found in favor of private medical colleges, he predicted that you would conclude that the Medical Council of India would have no jurisdiction, he predicted that Justice Dave would dissent, all three of them are correct. Justice Altamas Kabir: Err, yes they are. But at the same time I would repeat, that Justice Dave was going to dissent was something that was not known to us. Karan Thapar: That maybe the co-incidence? Justice Altamas Kabir: Either it’s a co-incidence or a leak, but it is not from here. Karan Thapar: You are absolutely confident that there was no leak, either from your Chamber, or at your home, or from the Supreme Court? Karan Thapar: Now a set of issues connected with the NEET judgment, was that in his dissent, your colleague Justice Dave said, that he had to be quick and therefore short, because of paucity of time, and he also said there was no prior discussion with you and perhaps he did not have proper time for reflection and that worries people when a Judge doesn’t have adequate time. Justice Altamas Kabir: Well, if I remember correctly, the copy of the judgment- the draft was made over to Justice Dave for atleast about ten days or one week. Atleast one week before the judgment was delivered. Karan Thapar: In your words, Justice Dave had adequate time, and to complain of paucity of time, is wrong. Justice Altamas Kabir: Absolutely. Apart from that, what was the main issue involved? The main issue involved in this case was not whether it benefitted students, benefitted people; it was not that at all. It was a legal question. The legal question was simply this, does the Medical Council of India have the right or the jurisdiction, or the authority under the law, to impose a single window exam. Karan Thapar: Quite right. So what you’re saying is, I’m repeating it again because it is so important to be categorically correct. You’re saying that when Justice Dave in his judgment, he says that he has to be quick and therefore also short, and talks about paucity of time, that paucity of time is untrue, he had a clear ten days. Justice Altamas Kabir: See, he had sufficient time if we put it this way, to look into the judgment, and the very first opening lines as you would find in the judgment like this, it set out what were the actual issues involved. Just one more thing, those were the issues which he did not address. He went by a personal emotional feeling, if I can understand from his judgment. What he has said is, he believed that a single window examination would be beneficial for the people, but that is not the law. Karan Thapar: You’re saying that he went by an emotional response rather than the legal point of the issue. Karan Thapar: Let’s leave that aside. A second matter that arises from your tenure as Chief Justice is the criticism that you often, wrongly and improperly, took in hands matters that were actually the concerns of other existing Benches’ of the Supreme Court and your critics say that you did this with some connection with the ‘Guthka Case’, the ‘Sahara-SEBI Case’, the ‘Jayprakash Associates Case’, the ‘Sunil Mittal 2G Case’. How do you respond to that criticism? Justice Altamas Kabir: I’ll take one at a time. Let us take the Jayprakash Case. Right. This was a case from Himachal Pradesh, where the High Court had directed that a certain amount of money, some hundred crores or so, were to be deposited as a fine on the basis of pollution laws. Right. Karan Thapar: The former Supreme Court bench had refused, you accepted and agreed and your critics say that you were improper and wrong to step in. Karan Thapar: Can I say something? Justice Altamas Kabir: No, he was not prevaricating but the matter issue was before His Lordship till he took up this Bench and at that bench when it was mentioned, His Lordship said since I’m not in a position to take up the matter now, please mention before the Chief Justice. Karan Thapar: In other words, you took it up at the specific suggestion or request of Justice Patnaik. Justice Altamas Kabir: They mentioned the matter before me. Karan Thapar: Making up to a very important point that upto now people have ignored, but the reason why I want to pursue this is because on Wednesday, a Bench headed by your Successor Chief Justice P Sathashivam, actually sharply criticized the order that you passed. I want to quote what that bench said; they said “We do not approve the manner in which the interim orders came to be passed; we do not sit on appeals over orders passed by a Court” and that “the orders should not have been passed”. Surely, that is indictment of what you as the Chief Justice of India, just a few days earlier did! Justice Altamas Kabir: I agree with you that it is an indictment but it is not a correct indictment. Whatever he has said, is unfortunately incorrect in the sense, I’m making this point once again, that this matter was mentioned before me because there was no interim order, at the same time there was a direction for them to pay the amount of hundred crores, fine. What I did was, I did not pass an interim order or any other orders upto a certain stage. Karan Thapar: If you agree that it is an indictment and you add that it was an incorrect indictment, do you feel embarrassed or do you feel annoyed? Justice Altamas Kabir: I feel both. And I’m going to take some kind of action if this quote turns out to be true, if it was said in the open Court. Karan Thapar: It was on the Front Page of Thursday’s Times of India, it was not denied by the Chief Justice of India and his fellow Judges on the Bench I presume, they stand by it. What action do you propose to lay? Justice Altamas Kabir: I’ll tell you one thing. I had spoken to the Chief Justice, Justice Sathashivam, as soon as I’d seen the news out in the morning. Karan Thapar: What did he say? Justice Altamas Kabir: His Lordship said I’ve never said this. Karan Thapar: Why did he deny it? Justice Altamas Kabir: Then I spoke to Justice Gogoi, he was a partner in the Bench. I asked him, “Did you all say this?” He said, “Certainly not! We never said this at all”. Now, I’m going to take some positive steps in the sense, that I have requested these judges to give it to me in writing and then I shall, if necessary, take it to the Times of India. Karan Thapar: So, the point that you’re making to me is, and I’m underlining it, you feel both embarrassed and annoyed. Justice Altamas Kabir: That’s right, I am. Karan Thapar: Do you believe that if these comments turn out to be correct and have been made by one of the Judges, you owe an apology? Justice Altamas Kabir: Absolutely. Certainly. Karan Thapar: You have no doubt about it? Justice Altamas Kabir: No doubt about it. Karan Thapar: If Justice Sathashivam has said what I actually quoted, you are owed an apology. Justice Altamas Kabir: That’s right. Karan Thapar: Let’s come to the third issue that arises from your tenure as the Chief Justice. Prashant Bhusan, a very senior Supreme Court Advocate, has questioned the way you, within three to four days of announcement of your successor, appointed a Constitutional Bench to go into a matter connected with him and he says that this is perhaps a conflict of interest because it concerns a certain range of doctors, some of whom are your personal physicians and are treating you and this not a matter that you should have gotten into at all. Justice Altamas Kabir: I don’t think so, I think he’s got it all mixed up, like he normally does. Anyway, Prashant Bhusan, as you know very well, he has…the media has made him what he is today, I don’t know if you have seen him appearing in any other matter except for matters relating to Public Relations. Karan Thapar: Okay against this criticism that he has made against and he had made it publicly, he has gone into the wrong end of the stick. Karan Thapar: Does he owe you an apology for having gone public with this criticism? Justice Altamas Kabir: Of course. All of this are nothing but cannons. I don’t know why but there seems to be a kind of a, just before I retired, since a week before then, certain newspaper items began to come up. Karan Thapar: I have to ask you precisely, that why is it that just before you retired, and shortly after you retired, stories or allegations, criticisms based around facts or mis-reports emerging in the newspapers? Why are you suddenly being targeted? Karan Thapar: Can I interrupt; for the sake of the audience I would clarify that the frontline news in the Indian Express was a report from the letter written by the Gujarat High Court Chief Justice, alleging that bias has let you to not elevating him to the Supreme Court which he should have been elevated but you were aggrieved because he never put away with the accusations against your sister as Judge in the Calcutta High Court. Why all of this is suddenly emerging now? Justice Altamas Kabir: I don’t know, maybe because no longer I have the control over the Bench. I have retired. Karan Thapar: Are you being targeted, are you being picked upon? Justice Altamas Kabir: I would certainly say so from a certain section. Definitely. But I think we should get a response from the members of the Bar in general. Karan Thapar: Many of these stories are emanating from fellow judges, I’m summarizing and guessing but its folded accurate guess, does it worry you that people who were your colleagues until last week are now leaking stories about you, true or false? Justice Altamas Kabir: I wouldn’t comment on that. If there is, then I’m sorry to hear such a thing could have happened, but I would have never expected any of my colleagues to do this. Karan Thapar: Before I change the subject, two quick questions. Do you have enemies that you have accidently, or inadvertently or deliberately created? Justice Altamas Kabir: Yes, yes, Prashant Bhusan is one of them I guess, because I’ll tell you why. Personally I believe that the High Court’s powers in writ jurisdictions should not be forgotten. The High Court should not be degraded of its powers that comes directly under Article 32 of the Constitution…. Karan Thapar: I understand, so you’re saying that Prashant Bhusan is one enemy; do you have any enmity or bad blood to put it sophisticatedly with your successor Justice Sathashivam? Justice Altamas Kabir: Not at all. There is no reason why it should be. Not at all. Karan Thapar: No reason that you can think of. Do you think that is not even possible? Justice Altamas Kabir: No, I don’t even think that is right to be commented on, no, I don’t think so. Karan Thapar: Discretion is a better part of the valor in your answer, I note. Justice Altamas Kabir: Well, take it for whatever it is. There’s one more person who could be a part of this, and that is one section of the press. And this is not exactly a surmise but the way in which things have been reported recently, seems to suggest that. Karan Thapar: Are you suggesting that The Times of India, which has many critical stories about you, is targeting you? Justice Altamas Kabir: It looks like it. And I don’t know for what reason. Karan Thapar: The Indian Express possibly as well? Justice Altamas Kabir: Indian Express they brought out that letter which has been written by the Gujarat Chief Justice, now, there I had explained in my press release that they possibly do not know how the collegiums functions. Karan Thapar: In other words, the Indian Express story about you can be put down to ignorance; but the Times of India story, is motivated. Justice Altamas Kabir: Is motivated. Karan Thapar: Some of the journalists, and I’m going to name them, Dhananjay Mahapatra has been highly regarded as a legal correspondent. Does he have an access to files? Justice Altamas Kabir: I wish I knew, because when I was office, atleast two months before I retired from office, he was writing all sorts of, whatever was good. He was publishing well. But at the same time, he did want an interview with me. And I said no. Karan Thapar: And you’re suggesting by that answer, with that sudden change in tone, which went from complimentary to critical, because you refused him an interview. Justice Altamas Kabir: That could be one of the reasons. I cannot fathom anything else. Karan Thapar: Okay, let’s get out of this. Leave now, this whole business of allegations, stories, innuendo about you, or the fact that you’re being targeted and picked upon, either by the fellow judges or the press, let us now come to the central issue of concern to the Indian people. Justice Altamas Kabir: But I would still like to say something about the process how the collegiums work. Karan Thapar: I will come back to that. The first issue I would come to before I come to the issue how the collegiums works, it concerns the corruption in the judiciary. The former Chief Justice, Justice Jagdish Sharan Verma said before he died that he could not say there were no corrupt judges in the Supreme Court; Former Law Minister Shanti Bhusan swore an affidavit that eight of the fifteen Chief Justices were corrupt; Mamata Banerjee, Chief Minister of West Bengal said that money is paid to buy judgments. Do we have a serious problem of corruption in the judiciary? Justice Altamas Kabir: At the Supreme Court level, I don’t think so. Karan Thapar: When you say ‘I don’t think so’ that does not sound very confident. Justice Altamas Kabir: Err, well, I particularly cannot know whether somebody is doing something or not. It is not possible to tell if somebody does something underhand. Karan Thapar: I will tell you, the Supreme Court itself creates a doubt in the mind. The Campaign for judicial accountability has raised serious questions as regards the property of Chief Justice Agarwal; the income tax department is now investigating into the alleged disproportionate assets of former CJ Balakrishnan, both were Chief Justices just a couple of years ago. You know that the former Chief Justice, Justice Dinakaran of the Karnataka High Court could not be elevated because of question marks regarding his financial dealings. Justice Sen of the Calcutta High Court almost got impeached except he saved himself by resigning; Justice Yadav of the Punjab and Haryana High Court is actually facing a Court proceeding. People turn around and say when such eminent Justices, and I have named five atleast, face serious question marks, is there corruption at the highest level? Justice Altamas Kabir: Alright. Take Justice Balakrishnan. Many allegations have been made against him, but nothing has been proved. He is still the Chairman of the National Human Rights Commission. He should definitely step down as the heads of the National Human Rights Commission, and if he doesn’t, the Government should sack him and that was said by one of his most illustrious speeches. Karan Thapar: What are the things that you are suggesting? Are you suggesting that Justice Verma’s record is entirely just and clean? Justice Altamas Kabir: What I would suggest is simply this. That maybe it is better when you’re in office, to say things, than when you demit office, you start opening your mouth. Karan Thapar: Are you accusing him of opportunism? Justice Altamas Kabir: I wouldn’t say opportunism, because he wouldn’t get out of this, but certainly this sort of criticism after when a person demits office, doesn’t behold. A person of that stature. Karan Thapar: Let us come back to the key issue of corruption in the judiciary; you by your answers suggest that you are minimizing it, are you doing that, because as a judge it would be awkward for you to let down this side in public or you genuinely believe that what the concerned media, the public say and that the corruption is exaggerated? Karan Thapar: And the campaign against Judges Accountability has named other judges as well which is not coming to my mind right now, but it is there in the net courses, so there must be atleast fifteen more. Justice Altamas Kabir: I don’t remember so many, this is an exaggeration. By and large I feel the judiciary is above fault. Karan Thapar: We have very little time and in this little time I would like to raise a connected issues, which is the collegiums system of appointment of appointing judges. Once again, Former CJ J S Verma, who’s 1993 judgment led to the setting up of the collegiums system went on record to this particular program, that India now needed the National Judicial Commission, that the collegiums system wasn’t functioning properly, that it wasn’t selecting the right people, and let me add, that position is endorsed by the former Chief Justice of the Delhi High Court, Justice Shah, it is endorsed by Seniors like Fali Nariman and Soli Sorabjee as well as by the Supreme Court Bar Association. As the former Chief Justice of India, where do you stand on this issue? Justice Altamas Kabir: Let us take Justice A.P.Shah first, our former CJ of the Delhi HC. Justice A.P.Shah is a person who has reason to be aggrieved. He was not brought to this Supreme Court. I don’t want to go into the details as to why he wasn’t bought, but there must be some very, very strong reasons. Karan Thapar: You mean his opinion is motivated? Justice Altamas Kabir: It’s motivated. Karan Thapar: But what about Fali S. Nariman, what about J S Verma, the architect of the collegium system, now saying that it is not functioning and frame a National Judicial Commission instead? Justice Altamas Kabir: One thing I will say is that I wish Justice J S Verma any of these things a little earlier. Karan Thapar: He said on October last year on this very program. Justice Altamas Kabir: Yes, why not earlier? Karan Thapar: After it took time for him to realize. Justice Altamas Kabir: So long? So long it took him to realize? When did he retire? It is not that. Karan Thapar: Let me come to one point, the charge against the collegiums system is that it is neither transparent nor objective. You don’t have written laid down criteria for selecting the judges and as a result quite often the selection made by judges is subjective both in terms of those who elevate and as well as those who they refuse to nominate. Justice Altamas Kabir: Have you had any chance of reading of what is known as the ‘Second Judge’s Case’? That is the case which was file by the Adv. on record association of the SC or the SP Gupta case? Over there it says that the, what was considered as appointments, what are the qualities of a judge. These have been very clearly defined in there. Karan Thapar: But they are not laid down in writing, are they? Karan Thapar: But they are not the criteria’s that are made in writing, and as you read, it will be as follows, that quite often judges make assumptions that are subjective and that subjectivity often means that the wrong person often comes up. Karan Thapar: We are hopelessly out of time, sorry to interrupt, but is the point that you are making is that you believe that the collegiums system is working perfectly? Justice Altamas Kabir: I would say it is. Under the circumstance, the best that you can have. Karan Thapar: Do we need to switch to a National Judicial Commission to improve the selection process? Justice Altamas Kabir: I don’t think so because the Government is the biggest litigator. It is the largest hand of litigation in the country. Karan Thapar: But why do you think the NJC would be dominated by the Government? When there is the opposition on one side and we have the eminent jurists on the other side; would that be preferable? Justice Altamas Kabir: but at the same time, no, because in that case, the independence of the judiciary, in my view, would be hit. And please, ask your readers or whoever is listening to go through the P. Reference of 1998, and also the other judgment. Karan Thapar: We are way out of time and I would like to end by asking you one last question. Your positional repo as the most recently retired Chief Justice and it’s been just eight days that you have retired, that the collegiums system is working perfectly under the circumstances; we do not need a NJC? Justice Altamas Kabir: One thing, I did not say perfectly, but that is the best that we can have, under the circumstance. Karan Thapar: You don’t think that there is any angry set of protests by the Gujarat Chief Justice because he wasn’t elevated to the Supreme Court, which we mentioned earlier, or, the fact that in your own press release, repeatedly he was thwarted by the same collegiums when you wanted to elevate the Madhya Pradesh Chief Justice. That is the pro that it is not working? Justice Altamas Kabir: No, no. the collegiums cannot be enforced by anybody. It is a collective decision. Karan Thapar: So you stick by the collegiums? Justice Altamas Kabir: It says in that judgment, that out of five, even two choose to defy, then they don’t refer the name. Karan Thapar: So you’re speaking to stick to the collegiums? Justice Altamas Kabir: For the time being, yes.